“To summarise what our first four years of Labor’s Medicare cancer plan means for Australians – up to 6 million free cancer scans, 3 million free appointments with specialists and an affordable medicine guarantee. This is our vision for the future, our vision to build Medicare. We can pay for it and we can deliver it because of our reform decisions. We choose our healthcare system over bigger tax loopholes. So in conclusion, my fellow Australians, I suspect that some in the government will spend a lot of time telling you to be afraid, afraid of change, afraid of new ideas, afraid of our future, afraid of each other. I expect we will see more of that in the campaign ahead. I have a different view. I’m optimistic about our nation’s future because this country has so much going for us, a continent to call our own, next to the fastest growing economies in the world. The resources to be an energy superpower. We have the skills and science and get up and go to create new industries, and best of all, we have our people. Australians are hardworking, caring, brave, smart and generous. We will never be the biggest country many the world, we will never seek to impose our ideology on other nations but I believe if we’re not the biggest, we should still aim to be the best, the best in education and skills, the best in health and aged care and looking after people with dementia, the best in fair wages and fair reward for your work. That is the real choice that our country faces at this election, it is the decision which every Australian has the right to make. Do we want the best healthcare system in the world or the biggest tax loopholes? Do we want our children to get the world’s best education or the world’s most generous tax subsidies? Do we want a fairer, more equal country where the economy works in the interests of everyone, or do we want another three years of drift with the top end of town profiting much better than everybody else? My team and I have made the reformed decisions to put a fair-go action plan forAustralia, so Australia can be the best we should be. We choose a voice to First Australians enshrined in our constitution. We choose renewables and we choose real action on climate change. We choose the ABC. We choose equality for women of Australia, equality for everyone. If these things matter to you, if you believe that when all is said and done about politics the most important things are family and health, if you believe that handing on a better deal to your kids than the one you inherited from your parents, if you believe that is what is the sort of vision we should have for Australia, then when you cast your vote in May, choose a Labor government for all Australians. Women and men of Australia. A Budget should sketch the big picture. Build for the long term, write Australia large. That’s what a Labor Government will do, strive for the best. Because Australians deserve the best. But instead, on Tuesday night, we received an exercise in numerology. A recitation of numbers. No passion, no national story, no vision laid out to divine where the country is and where the country is going. And no reform. The same promises made and broken, six years running. Yes, there is a third Prime Minister. But where it mattered, the same Liberal Budget. The same void where an energy policy should be. The same failure on stagnant wages and rising cost-of-living. The same denial on climate change. The same $14 billion cut to schools. And the same $2.8 billion cut to hospitals. There was one new feature in this Budget, albeit troubling. The short-changing of the National Disability Insurance Scheme by $1.6 billion, to prop up a flimsy budget surplus forecast. Now it looks a lot more like dodgy accounting than good economic management. I freely acknowledge government members sincerely care about people with disability. But the truth is, the record of the last six years, the government has made a record of poor decisions regarding the NDIS. Delaying the signing of funding agreements with the states. Capping staff numbers for the National Disability Insurance Agency – leading to an outbreak of contractors and consultants undermining the system. Government shrugs, and say the $1.6 billion wasn’t needed, because of a lack of demand. There are thousands of Australians who have embraced the promise of the NDIS but whose legitimate demands have simply not been met. The young man in Ballarat who has waited more than two years for a wheelchair, waited so long that he ended up in hospital with pressure sores. The family whose daughter has an intellectual disability, who have waited ten months for funding for the speech therapy she needed to learn to make friends at school. Or the family of a profoundly deaf young man who was denied interpreters and training in Auslan and has spent the last two and a half years appealing the decision. All these people… the carers seeking modest respite…the parents, the loved ones, filling out the forms, calling time and time again for promises not fulfilled, waiting on the phones…. They do not tell me there is a lack of demand, they’re talking about a desperate need. Working with the Member for Jagajaga, with people with disability, their carers and an army of advocates to help create the National Disability Insurance Scheme is one of the most rewarding things I’ve ever been part of. We will lift the NDIA cap on staff numbers, so we can get the support out the door, keep the promises made to people with disabilities. 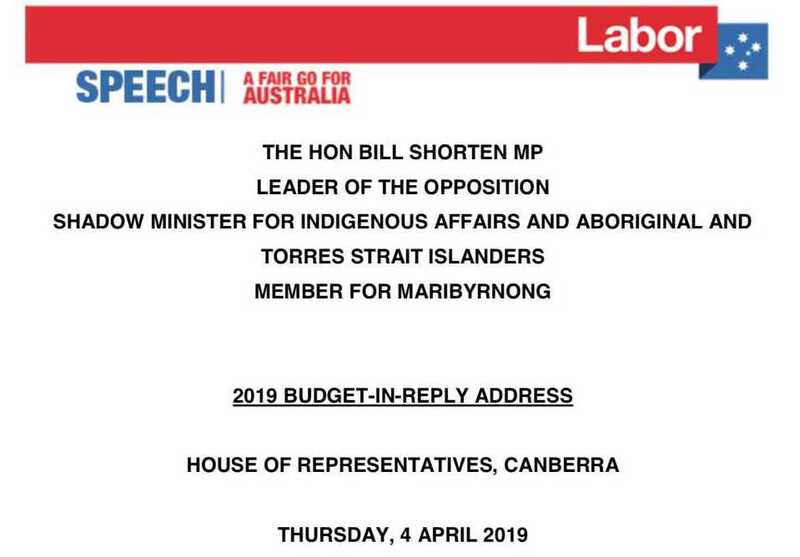 I acknowledge our opponents have finally seen the light on supporting the bigger, better and fairer tax cuts for 10 million Australians that I put put forward at my last budget reply speech. If you earn between $48,000 and $126,000 – no matter who you vote for in May – you will get the same tax refund. But the Liberal tax plan does not do enough for 2.9 million Australians who earn less than $40,000. About 57 per cent of these are women. Child care workers and classroom assistants. Hairdressers, office managers. And they are parents returning to work, part-time. In a lot of cases, these are the very same workers in retail, hospitality, pharmacy and fast food who have already had their penalty rates arbitrarily cut. Labor will provide a bigger tax refund than the Liberals for 3.6 million Australians. All told, an one billion dollars, for low-income earners in this country. 6.4 million working people will pay the same amount of income tax under Labor as the Liberals. And another 3.6 million will pay less tax under Labor. But we will not be signing-up to the Liberals’ radical, right-wing, flat-tax experiment, way off in the future. A scheme which would see a nurse on $50,000 paying the same tax rate as a surgeon on $200,000. We won’t back a plan that gives a retail worker on $35,000 less than $5 a week… …while an investment banker pockets more than $11,000 a year. This is not a tax plan, it’s a ticking debt bomb. And it is neither fair nor responsible to lock-in these billions of dollars in tax giveaways flowing disproportionately to a relatively few Australians – and so far into the future. Especially when you consider the foreboding we see in the global environment. The drop in the 10-year bond yields. This is the time when Australia should be building a strong surplus, a fiscal buffer. The Liberals talk about being back in the black – but the Budget papers reveal a much paler shade of grey. What we need is a fighting fund for the nation, a strong surplus to protect us from international shocks. Surpluses built on real reform – not cutting schools and hospitals, not shortchanging the NDIS and not banking on the price of ore in a blue sky environment. And tonight I recommit that is what Labor will take to the next election – stronger surpluses, paying down national debt faster. Guaranteeing everything from our commitment to defence spending at 2 per cent of GDP, drought relief for farmers and keeping our borders secure. Nearly six years ago, my united team and I made a choice. We decided not to be the kind of Opposition who just stay quiet, cross our fingers and hope the Government would tear itself apart. We decided to lead the reform debate, with a bold agenda. We believe the Australian people are hungry for a united, stable government with a real vision for the future, one that can make hard decisions. We believe government has a responsibility to leave the place better than we found it. That’s why we’re going to stop the intergenerational unfairness in our tax system. If you’re currently negatively gearing the rules won’t change. If you want to use it on new homes, you still can. But we cannot have property investors playing with loaded dice against our young people, Generation Y and the Millennials. Getting together a 20 per cent deposit – plus stamp duty – is so much, much harder than it was 20 or 25 years ago. And it’s even more difficult, when your government uses your taxpayer money to subsidise the property investors bidding against you. The intergenerational bias that the tax system has against young people must be called out. A government has to be brave enough and decent enough to stop the bias against first home buyers and young Australians. And we will be that government. The same goes for dividend imputation. If the tax office pays a tax credit to someone who pays no tax, this is a gift. It’s a gift that is costing taxpayers nearly $6 billion every year – and growing so fast that it will soon be more than what we spend on public schools. Now it’s not illegal, it’s not immoral – but it’s just not sustainable anymore. It’s doing real damage to our economy – and our environment. And we can measure cost of inaction: bushfires, droughts, floods, in extreme weather and damage to our farmland and our Reef. For the sake of the Australia that we hand on to our children, a Labor Government will reform, will not shirk the task of reform – it will take real action on climate change. Now tonight – and at this election – Labor is offering the Australian people a fully funded Fair Go Action Plan. And funding a health system that is there for everyone. We believe Australia does best when working class and middle class Australia gets a fair go. When the economy is managed in the interests of everyone. When the people who create our national wealth, get their fair share of the national wealth. And when everyone has an equal chance to fulfil their potential. This is why investing in the future, always begins with education. This is where the difference between Labor and the Government could not be more stark. Nine out of ten new jobs created in the next four years will require either a university degree or a TAFE qualification. Only a Labor Government will be prepared to properly fund both. We’ll uncap university places, opening the doors of higher education to an additional 200,000 Australians. And when it comes to vocational education, Labor is backing public TAFE all the way. I’ve been fortunate to have visited about 30 TAFEs around Australia since the last election. The teachers and students are inspirational. My mother was a great teacher. She taught me that you can measure a nation’s values by how much it values education. I want every child in Australia to get the one-on-one attention that they need to thrive. I want Aboriginal kids to get genuine equal opportunity, children with disability or learning difficulties getting the support they need. I want every child participating in sport, trying drama, learning music, going on camps, getting access to new technology. And not as optional extras, to which parents pay increasing levies, not and luxuries that rely on the teachers raising the money themselves. Guaranteed because every school in Australia should offer every child the same world of opportunity. And there’s one more thing that we will do to make Australian schools the best in the world – we’ll make Tanya Plibersek the Minister for Education. Experts tell us ninety per cent of a child’s brain develops before the age of 5. Last year, China enrolled 46 million three year olds in pre-school programs. Australia is falling behind in the early years education – and that affects our children right through their educational lives. If you vote Labor, we will guarantee universal access to pre-school or kinder for every three year old and every four year old in Australia. 15 hours a week, 40 weeks a year. Two years of pre-school is global best practice – and it’s only just good enough for our kids. High skill workers. High quality products. High value services. And higher-wage jobs. This means backing local businesses and industries. We backed a tax cut for small and medium businesses. And we will provide an extra 20 per cent tax break for every business that invests in productivity-boosting equipment above $20,000 – whether that’s a big manufacturer buying new technology, or a tradie getting a new ute. Defence industry – and commercial ship-building, to revive our Merchant Marine and see more Australian ships, flying the Australian ensign. Embracing renewables will also create thousands upon thousands of new jobs for Australia. Labor will provide a $2000 payment to families who want to join the fight against climate change and the fight to lower their power bills by installing a battery storage system. And here’s the remarkable thing – we already have every single resource to make a lithium battery, right here in Australia. So instead of the usual trope of shipping the minerals overseas and buying back the finished product at vastly inflated prices, let’s make the batteries here. And let’s do this with electric vehicles and charging equipment and stations too. Supported by Australia’s first Electric Vehicle Policy. And rather than relying on China and India to accept our plastic and waste… …or to leave it choking our waterways and killing our marine life, let’s recycle it here at home. When it comes to clean technology, I believe we can make three words famous right around the world: Made in Australia. Building an economy that works for everyone means a massive building program, right across our nation. And we will invest in safe accommodation for women fleeing violent relationships. Upgrading the roads around Kakadu  And Phase 2 of the ACT light rail. And – thanks to Albo’s hard work – the work is just beginning. Labor will continue to develop and support the development Northern Australia: including overdue upgrades for the beef roads and the Rocky ring road. And tonight I can announce we will deliver $1.5 billion to upgrade the Gateway Motorway from Bracken Ridge to the Pine River – and the next stage of the Bruce Highway from the Northern Suburbs to Caboolture. There’s another big difference between Liberal and Labor on infrastructure. 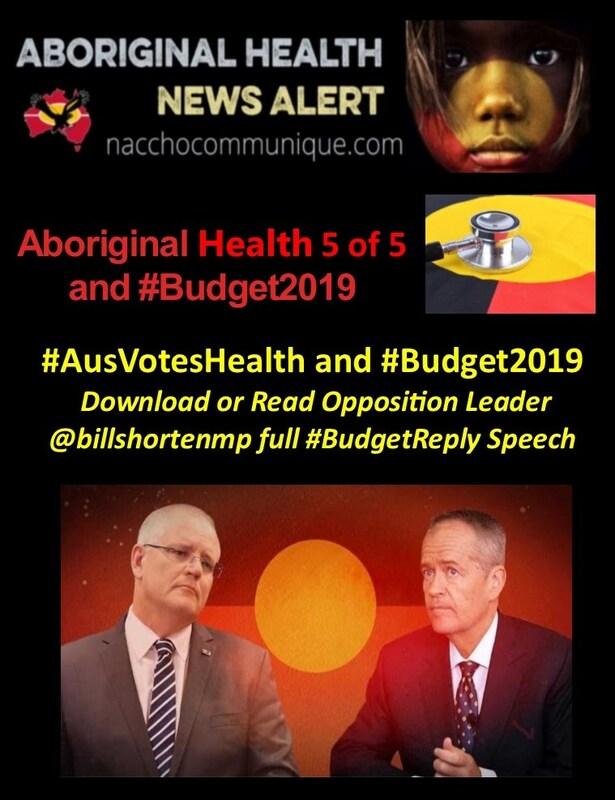 In their budget you have to vote for the current Prime Minister at this election… … then you have to vote for whoever is their leader at the next election……and that’s before anyone even digs a hole. Our projects are not on the never-never, they are locked in to our first budget. There’s another difference that I offer the Australian people, frustrated by the constant short-termism in the infrastructure debate. If we are elected, I will invite the then-Opposition Leader to be involved in nominating directors to Infrastructure Australia, so we take the politics out and we make generational decisions in infrastructure for once and for all time. And every time we invest Commonwealth dollars in infrastructure projects. We’ll make the rule that 1 in 10 people employed must be an Australian apprentice. The bad news is that over the last six years under the Liberals, apprenticeships have fallen by 150,000. …a Labor Government can repair the damage done. We need to get wages growth going again – for workers, for the economy, for confidence and consumption. Because when we boost the spending power of working people, that money flows back into the tills of small businesses. In the last six years, three Liberal Prime Ministers and three Liberal Treasurers have signed-off on official forecasts for wages growth…they have been wrong 27 times in a row. 27 times they have promised and not delivered. On Tuesday night, the Treasurer boldly said he would “like” wages growth to be higher. He would “like” that. After six years of stagnation: liking and wishing and hoping is not a plan for working people. Since the last election, wages have risen by around five per cent – while company profits have increased nearly forty per cent. If we win the election we will legislate to restore the arbitrary cuts to Sunday and public holiday penalty rates in our first 100 days. We will stop companies using sham contracts and dodgy labour hire arrangements to cut people’s pay. And we will help the 1.2 million lowest-paid Australians, by creating a living wage. Of course, we will consult with employers and the independent umpire, and of course we will take into account the capacity of business in the economy to sustain the wages’ growth. But I don’t want any Australian adult who works full time, to be trapped in poverty. A sensible, overdue plan to achieve moderate but meaningful improvement in wages. And whenever we talk about fair pay, it includes equal pay and fairer conditions for the women of Australia. A new push for better pay in women-dominated industries like early education. New measures to help boost the superannuation of working women. And 10 days of paid leave for people dealing with family violence. This is what you get from a political party that walks the walk on equality for women – and has so many talented women in our ranks in parliament right now. At this election, Mr Speaker, we are offering a genuine alternative for regional Australia. Better support for our dairy farmers to get a fair deal. Working to restore the Murray Darling to health. Helping restock the cattle herd of North Queensland. New investments in eliminating mobile black spots – and a more reliable NBN for small business. We’ll provide another $10 million to support regional news and emergency broadcasting, especially in areas affected by natural disasters such as Townsville, Tasmania and regional Victoria. 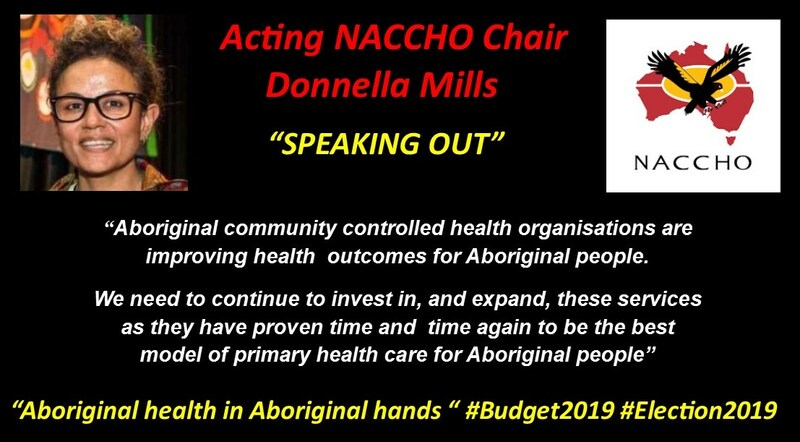 We can also give regional communities this simple, important pledge: no more privatising and out-sourcing human services in the bush. If you’re a pensioner or a veteran living in the regions, you shouldn’t be stuck on hold for hours waiting for help. You should be able to speak to a human being, face-to-face. Tonight I want to conclude by talking to you directly in your lounge rooms, about our vision for the most significant investment in Medicare in a generation. Cancer is one of the biggest killers in our national. Not for nothing is it called the Emperor of all Maladies. One in two of us will be diagnosed with cancer at some stage in our life. 145,000 of our fellow Australians are diagnosed with cancer each year. One way or another, we will all witness the ordeal. I saw it with my Mum and her battle with breast cancer. Chloe and I have seen it with dear friends of ours – some old, some far too young. Cancer is frightening, it’s isolating, it’s exhausting. And – all too often though – it is impoverishing. For so many people, cancer makes you sick and then paying for the treatment makes you poor. And I think a lot of Australians would be surprised to learn that all those vital scans and tests and consultations with specialists are not fully covered by Medicare. Instead, they cost hundreds of dollars, adding up to thousands, out of your own pocket. Australia has the highest rates of skin cancer in the world – and most people pay over $5000 for the first two years of their treatment. One in four women diagnosed with breast cancer pay over $10,000 for two years of scans and tests. Some men with prostate cancer are paying more than $18,000. And if you’re in Stage 4 cancer, you have to quit work, so your finances are already under horrendous strain. If you live in the regions, there are the added costs of travel and accommodation. Every year 300,000 Australians who need radiology just don’t get it – because they can’t afford it. That’s three hundred thousand of us. If someone you love has cancer, you’d sell the roof over your head if it would help, you’d sell the shirt off your back – but should you have to? Labor’s $2.3 billion Medicare Cancer Plan. To my fellow Australians, I will explain what that will be used for. Today, only half the MRI machines, that amazing technology – half the machines in Australia are covered by Medicare. People in the bush and the regions often have to drive hours, or pay thousands. We will guarantee that every single MRI machine which meets national standards, every single machine is covered by Medicare for cancer scans – full stop. The second part of our plan is to deal with the cost of seeing a specialist. As anyone knows, treating cancer relies on a marvellous team of experts. These appointments are part of your weekly routine, often for years. There is the trips, the waiting, the treatment, the recovery. Thousands of dollars. What this means over the next four years, is it means that an additional 3 million appointments will be bulk-billed – with no out-of-pocket costs.Reducing what you pay from hundreds of dollars – to zero. Every drug recommended by the independent experts, will be listed on the Pharmaceutical Benefits Scheme. Not just cutting the cost of your treatment – cutting the cost of your cancer medication too. I wish I could stand here tonight and guarantee you that we will find a cure. But no politician can give that promise. Under Labor – if you are battling cancer, you can focus on getting well, without worrying about going broke. I can promise that if you are in the fight of your life – a Labor Government will be alongside you every step of the way. This is our vision for the future. This is our vision to build Medicare. And we can pay for it – and deliver it – because of our reform decisions. So in conclusion, my fellow Australians – I suspect that some in the government will spend a lot of time telling you to be afraid. Afraid of change. Afraid of new ideas. Afraid of the future. Afraid of each other. I expect we’ll see more of that in the campaign ahead. I’m optimistic about our nation’s future, because this country has so much going for us. A continent to call our own, next to the fastest-growing economies in the world. The resources to be an energy superpower. The skills and the science and the get-up and go to create new industries. And best of all, we have our people: Australians are hard-working, caring, brave, smart and generous. We will never be the biggest country in the world, we will never seek to impose our ideology on other nations – but do I believe that if we’re not the biggest, we can still aim to be the best. The best in education and skills. The best in health and aged care and looking after people with dementia. The best in fair wages and fair reward for your work. That is the real choice that our country faces at this election, that’s the decision every Australian has to make. Do you want the best health care system in the world? Or the biggest tax loopholes? Do you want your children to get a world’s best education? Or the world’s most generous tax subsidies? Do we want a fairer, more equal country where the economy works in the interests of everyone? Or do we want another three years of drift, with the top end of town profiting much better than everybody else. My team and I have made the reform decisions to put forward a Fair Go Action plan for Australia, so that Australia can be the best that we should be. Labor offers stability and unity and a vision for the nation. We choose hope over fear. We choose the future over the past. We choose the best support possible for people with cancer. We choose fair wages and good jobs. We choose TAFE and apprenticeships. We choose a Voice for the First Australians enshrined in our constitution. We choose renewables and we choose real action on climate change. We choose equality for women of Australia – equality for everyone. And if these things matter to you, if you believe that when all is said and done about politics, the most important things are family and health. Then – when you cast your vote in May – choose a Labor Government, for all Australians.